January 21, 2018 Kids, Parenting, Win 75 Comments on Back to school- again! The school holidays are coming to an end and so begins that frantic time when we have to prepare for back to school. Each year is the same for us – uniforms, shoes, the school list and lunch boxes and bags…and so on and so on. Luckily this year only one of my three children needed new school shoes however I lucked out in the uniform department with one starting at a new school and needing everything from socks to jumpers $$$. When it comes to ‘Back to School’ there are few stores I use as my go-to’s and one of those is Smiggle. Smiggle has just about everything you need for school, homework and fun! Smiggle’s product range is enormous and their products are designed to inspire and develop creativity with original, fun and affordable stationery, accessories, gadgets and more, all in our bright fun, colours of pink, purple, green, blue and black. We have been preparing for the return to school with a few of the Smiggle products (pictured below). I love the quality of all the Smiggle products, the pencil case is sturdy and has heaps of compartments to keep odd shaped items like scissors, erasers and pencil sharpeners. The scissors come with a protective cover which is a great safety idea. The pencil case also has plenty of room in the main compartment for a full set of coloured pencils, highlighters, full set of textas and a glue stick! 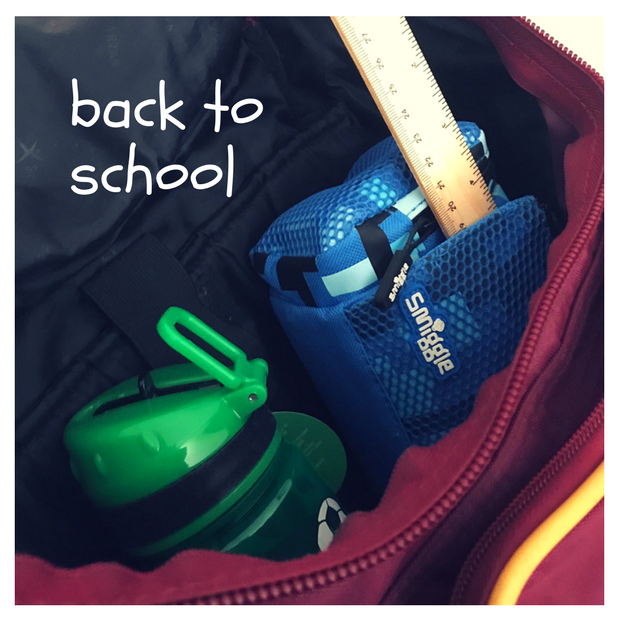 The drink bottles from Smiggle are always lots of fun and a good size for school bags and the glitter markers were a big hit with my daughter! I have a fantastic giveaway below. One lucky person will win a Smiggle Prize Pack valued at over $60. 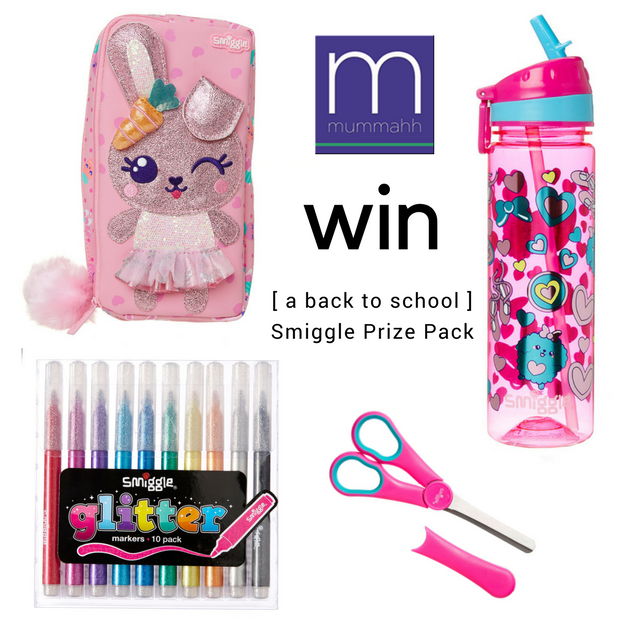 To enter tell me what you love about Smiggle, and how it makes back to school easier? The colourful and fun designs make my girls even more excited to head back to school to create with their new stationery! Give me an ‘F’, give me a ‘U’, give me an ‘N’! Everything about SMIGGLE spells fun. I love it because it’s stationery with personality. It’s where style meets mirth. Squiggles meets measurements. Sparkly meets matte. Smile meets a giggle. Makes school easier as it’s a dangling carrot for the kiddies to finish their homework and improve their grades. Especially their drawing and art skills – colour, glitter and different mediums keep them interested for longer. Now I have more adorable pictures for display! The fun and excitement of Smiggle has my daughter hooked. The style of stationery makes her want to sit and write or do school related things just because they are so much fun to use. She would really love this. I love seeing my daughters creations and artwork and smuggle are so unique bright and colourful you can’t help but love it. My 4yo daughters favourite colour is glitter rainbow so when she walks in Smiggle her little mind goes into overdrive. My girls love SMIGGLE, it’s fun, colourful and makes awesome gifts for my kids for birthdays and Christmas, that I know will hit the mark with them. The girls make sure they look after their SMIGGLE items at school, makes back to school easier because I know the SMIGGLE goodies won’t be lost. More like our second home where we simply need to stop. Smiggle adds sparkle and fun into going back to school so my kids are excited to be creating colourful creative pieces of work. Anything that gets the children excited for school is a major win! I love watching my little girl get excited about the stationary she is going to pick. I love walking into a smiggle store with my Miss 7, the colours, sounds and smells put us in heaven. Smiggle’s awesome for back to school, because having some special smiggle items gives her a happy feeling throughout the day, and if she’s happy, im happy too! Colour co-ordinated for little ones to easily identify their SMIGGLE school things on often madly rushed school mornings. Funky fun products but still , oh so practical .. and the quality is always there. Smiggle makes back to school more exciting and colourful, and whenever a smiggle item is pulled out I have a giggle! The Smiggle shop is right next door to Coles at our local shopping centre. It is the ultimate bribe for great supermarket behaviour to have a look in smiggle if you’re good at the shops. There’s something for everyone, boys and girls! So many different choices, colours, smells and feels! Both my kids love when they shop at Smiggle as there’s new stock all the time. Miss 8 loves all the stationary at Smiggle. She could spend the whole day there. Having all the necessities in one place makes back to school shopping so much easier and enjoyable for her to return to school! It’s impossible not to smile and feel instantaneously happy up on entering a Smiggle store! I love that choosing a school water bottle and lunchbox at Smiggle can bring such joy! But it’s the delight Smiggle shopping brings them that will see us return in the future for more! to make school just right! I love how colourful everything is, its like stepping into a rainbow, we especially love the size of the lunchboxes, we can hold everything! I love the excitement Smiggle creates for my kids knowing they’re going to use all this bright, colourful and high quality school equipment to complete their schoolwork with. Smiggle do everything a child needs for their school work so it was easy getting them sorted for the start of school. My girls love the array of bright colours Smiggle offer and can’t wait to use their new Smiggle equipment to show their creative side. I love the colours and smells of the products as they make using the equipment exciting to use which means my girl can’t wait to start school and use them. They colour in – even my son! 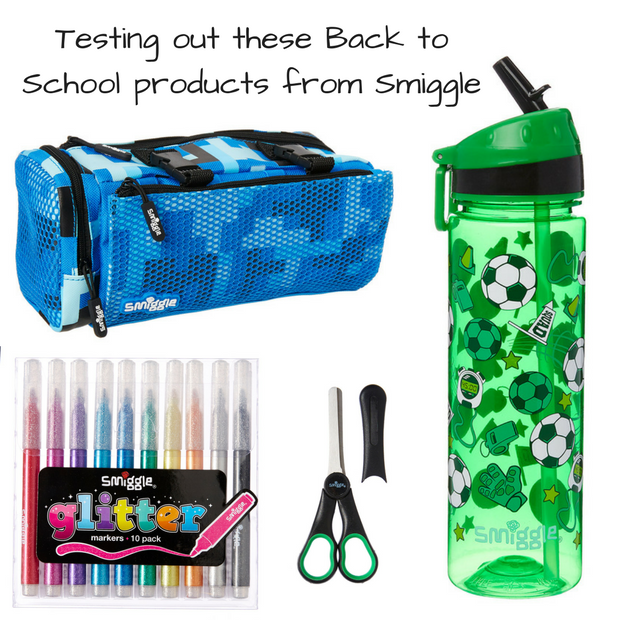 It makes my kids look forward to school so they can use their new Smiggle goodness! Fun, hip, cool and practical! Everything you want to buy your child to start them off for the year! Our family loves Smiggle’s bright colours and patterns. Smiggle makes back to school time easier, because Little Miss 5 LOVES going to Smiggle to choose her school stationery, allowing one ‘preparing for school’ task to be completed without fuss. My daughter loves Smiggle, because it’s cute, fun and colourful!! Smiggle has a huge variety and something for every boy or girl which makes going Back to School so much easier! Smiggles makes my kids excited about school and having their own stationary that they can’t wait to use! I like that there is a lot of various styles to suit a range of tastes, and there are many different products that are fun and functional! A smile & a giggle makes back to school a breeze! These products are super cute and mean there’s no convincing to head back to the books! Yes please my kids love Smiggle Nd would love a treat. My daugher came home from school one day in tears because she had been teased about her pencil case of all things. I’d love this Smiggle pack because she loves the brand and it would hopefully shut those darn bullies down! I love the durability and bright, fun designs! It makes back to school easier because letting the kids pick their fave items, they can’t wait to get back to school and show them off! I love Smiggle because it’s practical, the grandkids love Smiggle because it’s Fun and Cool. I have been rewarding the kids with Smiggle products for school, for being helpful over the holidays, which they are very keen to use. I love that Smiggle is bright, fun and childlike and that it caters equally for boys and girls. It makes back to school shopping easy for me, as it’s a one stop shop for everything my son and my daughter need for back to school. They love picking out a funky new pencil case, drink bottle and lunch box every year! I love Smiggle because of the cute characters they use to decorate their items. They make it easier to go back to school because my kids have fun picking out what they need and choosing which colour or character they want. And then it makes the first day back more fun because they get to show their friends their new stuff. My youngest started school this year and as a huge fan of Smiggle, she has been collecting smiggle stuff since Christmas for the big day. 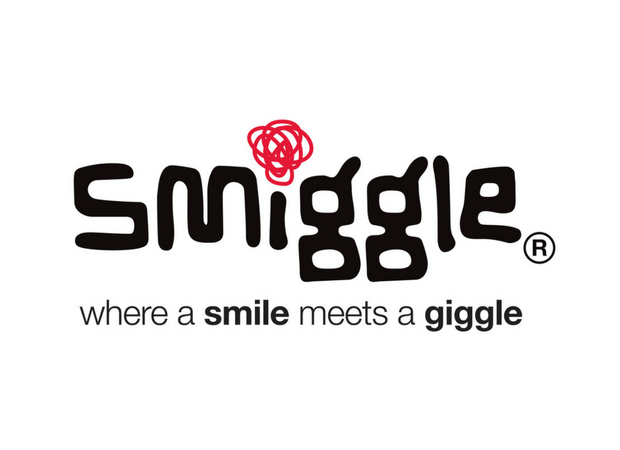 I love Smiggles variety and amazing products, there quality is amazing and i know they will last. Love that my kids can have gorgeous, novel products for school. The girls love all the cute and sparkly items they make, they also love to show it off at school. As a teacher I confess to the occasional bribe of a Smiggle prize.I also confess to buying Smiggle products for the child who may be financially disadvantaged and needs a learning or emotional boost that comes with being part of a peer group. We love smiggle to add a bit of individuality to our stationary! we also love the scents and the bright funky colors! Smiggle makes school easier because everything is in the one amazing store!! Smiggle is so funky it makes getting organised a breeze because the kids are actually excited about it. My girls love SMIGGLE and so do I. The colours are fun and inspiring. We love Smiggle. A one stop shop (easy for mum!) for guaranteed “cool for school”! Smiggle does make us giggle and it’s much easier to go back to school if you have a smile on your dial. That doing schoolwork becomes enjoyable! My daughter (and I hehe) love the products, they are so unique and colourful. We are just obsessed. A 37 year old can be in love with Smiggle too, right? Smiggle makes you giggle, my kiddies first day at school is shiny and bright so full of colorful goodies all thanks to Smiggles. My kids love Smiggle as it is so colorful and makes school, drawing and learning fun. They especially love the scented products. My daughter says they smell so good she just wants to eat them! I love that i can shop on my own and know that whatever i buy the kids will love! We love Smiggle! The colours, the designs, the smelly fun stationary, we love it all. Smiggle makes my kiddies so excited to head back to school because they can’t wait to use all their new Smiggle goodies. My boys love using Smiggle. It’s fun, cool, colourful and easy to use for all things back to school.